Inspired by a fellow crafter, stamper and friend.. this stunning card came to life! With rich, luscious colors, shine and a 'floating' feel - this card simulates a Stained Glass feel with no breaking to worry about. 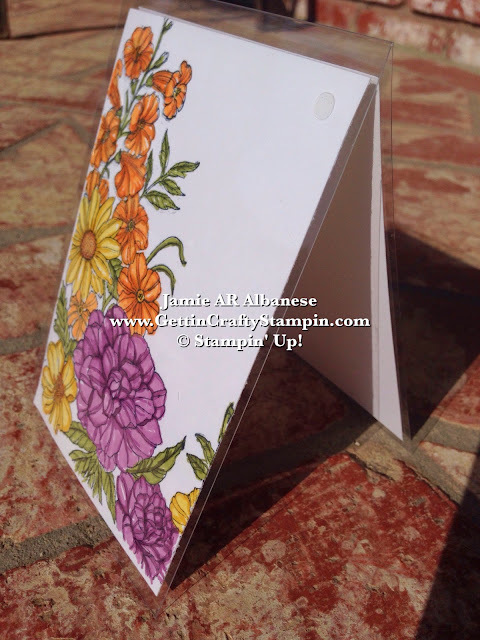 Create this fun, easy and WOW hand-stamped card that you can deliver smiles and sunshine with. See how I highlight the Blendabilites and Window Sheets for this Tool Tip Tuesday!! OK so I LOVE our Window Sheets!! They are PERFECT for my various crafts - from the windows in boxes or cards, Shaker Frames or as clear accents on cards, boxes and they work like a dream with the Big Shot!! 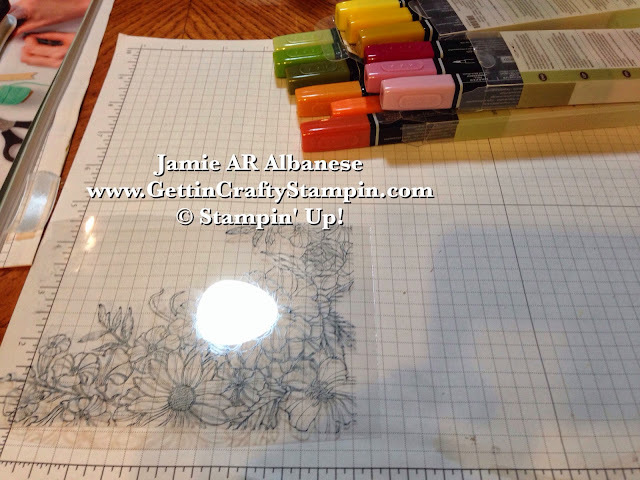 Here I attempted to use the new Memento ink pad and Blendabilities directly on the Window Sheet (that I cut to 4"x6" card and scored - the Stampin' Trimmer has BOTH the Cutter and Score Blade for easy use on crafting). Darn!! The Memento ink is NOT like the Stazon Jet Black ink pad. It doesn't dry on the Window Sheets - grrrr - lol. 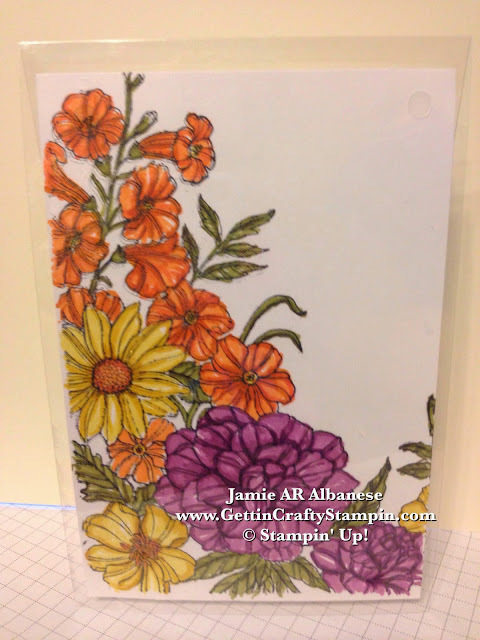 So I had to go wipe off this Corner Garden background stamped image and rethink my card. Stamping the image with the Memento ink pad (a must in using the new Blendabilities Markers) on Whisper White card stock. 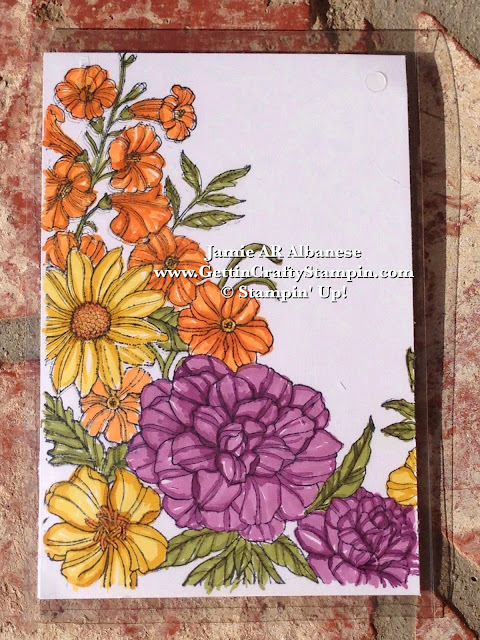 Here I cut the cardstock down to 3-3/4"x5-1/2" and used the Blendabilites to color in the flowers and leaves. I couldn't resist taking a photo on my front porch - placing this garden card out in nature to highlight the beauty and depth of the color and shine in this card. The Blendabilites Markers create a depth and elegance to this garden and the Window Sheets makes for a high shine, cool 'floating' card that will stand above the rest! I LOVE that Summer brings the blossoms and beauty of nature into our lives. Celebrating the warm weather, stunning blossoms and combining it with my love of paper-crafting is fun! 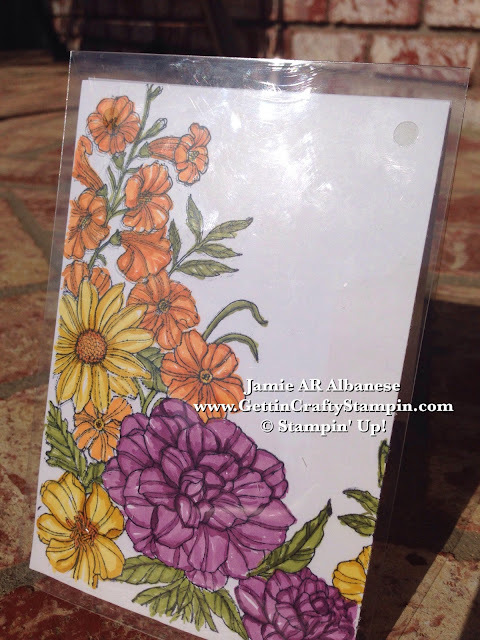 This hand-stamped stained-glass like card with depth of color and high shine is sure to WOW! So thanks for the inspiration from my fellow crafter - I hope that this delivers some color and smiles into your life! This Tool Tip Tuesday is a fun way to highlight these cool tools and show how to incorporate them into your crafting!